The possibilities are endless. Inquire. 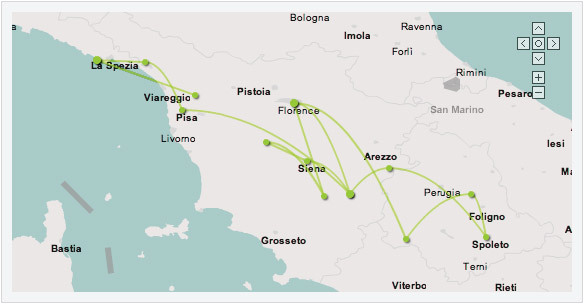 Itineraries for the Optional Rome & Venice Tour are found at the end of the itinerary below. Inquire about other optional tour itineraries. Today we will meet you in Florence and transfer to the beautiful hilltop town of San Gimignano. 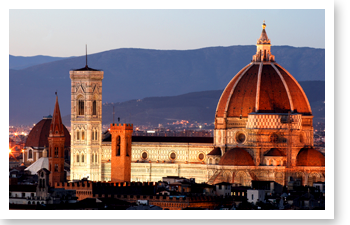 Depending on your arrival time in Florence, we may take a detour to Fiesole. This beautiful area above Florence offers a great bird’s eye view of Florence, ancient ruins and a small but interesting museum. You’ll have free time after orientation stroll with your tour manager to explore San Gimignano, which is peaceful and beautiful at night. Today we will explore Volterra, an ancient Etruscan town enclosed by intact 12th-century walls, with remnants of its defensive walls and Porta All’Arco gate dating back to 7th century BC. We will have a guided tour of Volterra with a local guide, who will take us to see the local alabaster artists at work and shop for souvenirs. After your free time, we will visit a prestigious wine producer in Bolgheri to sample some Tuscan wine. Bolgheri has received much attention for its special reds, which blend Cabernet Franc, Sangiovese, Syrah, Merlot and/or Cabernet Sauvignon to wonderful effect. Today we will enjoy one of the most picturesque areas of Tuscany, the scenic wine-making Chianti region. We will spend the day in Volpaia, a 12th century village dedicated to the production of wine. In the 1970s, Volpaia’s former homes, churches and underground passages were converted into wine cellars and olive oil presses, connected through an underground “wineduct.” You’ll have an opportunity to tour the town’s namesake castle and winery, Castello di Volpaia, and taste the Chianti Classico produced here. 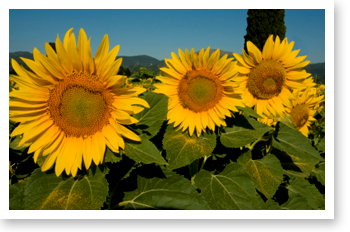 Volpaia’s wines are all made strictly using organic production methods. Your guide will introduce you to the town’s rich history, such as the della Volpaia family. This family made their fortune as master clock and instrument makers and counted Leonardo di Vinci among their closest friends. We will enjoy a tour of this fantastic village followed by tastings of their fine wine with pecorino and bruschetta. The group will have lunch at a wine bar after. You’ll enjoy the panoramic views over the surrounding vineyards as we make our way back to Pienza for the night. Today we will enjoy two towns known for wine. Our fist destination is the charming village of Montepulciano. It is one of the highest of Tuscan hill towns, built along a narrow tufa ridge, with a long main street and alleys that drop away to the walls. We will enjoy a tour of a fine wine producer with a historic wine cellar, and then give you free time to shop, have lunch and explore the town. 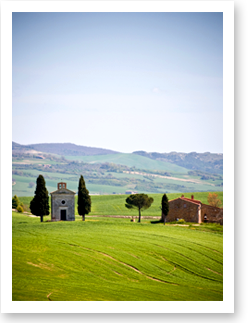 We’ll take a late morning trek to a nearby farm for a cooking class, lunch and tasting of the flavorful Pecorino cheese Pienza is known for. This morning we will travel directly to Bevagna, our base for the next 4 nights. This walled city has its origins deep in ancient history. There are many historic sights of interest here, including the church of the Madonna of the Snow, built on the ruins of a Roman temple, and an ancient Roman bathhouse featuring mosaics depicting assorted sea creatures. Today, Raffaele, your tour manager, will take you on a walking tour of his native village, Borgo San Gemini. We’ll time our visit with a local festival celebrating San Gemini’s medieval past, with the town’s historic center decorated with flags, candles and other special touches. After enjoying the festivities, you will visit Raffaele’s grandpa’s vegetable and herb garden, learning about some of the key ingredients in the local specialties you will sample for lunch. You will then proceed to Raffaele’s mom’s house, where his mother and aunt will have a home-cooked meal waiting for you. Today we will visit Todi, a lovely medieval hilltop town overlooking the Tiber River. Todi’s central piazza, originally the Roman forum, has several beautiful medieval buildings for you to explore. On our last day of the tour, we will finish in Florence, stopping en route in Arezzo, an important Etruscan town, for a guided tour of this interesting city. Arezzo is known for its antiques market and shops; we’ll stop for a guided tour and some free timet for you to explore, have lunch, perhaps tasting Arezzo’s famous Acquacotta, a bread soup made with porcini mushrooms. 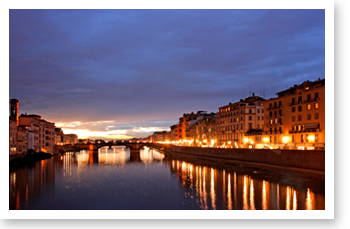 We will arrive in Florence in the late afternoon, when you will have some time to explore the city before our farewell dinner together.